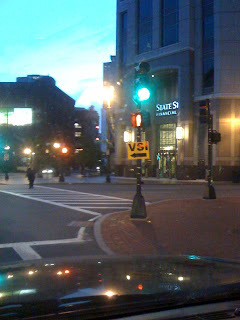 I spotted the telltale "VSI" sign near the financial district while driving home today around 8:30pm. As you can see, the sign pointed towards the South Station area. Anyone know what they were filming? And if Bruce was there? 3 Response to "The Surrogates Back Filming Downtown"
Filming was on Dorchester St. and was in one of the buildings, but plenty of extras roaming the streets. No idea if Bruce was around, but there was a good looking woman in blonde. Couldn't quite make out who she was from the distance. Bruce Willis is on set toda4, wearing a brown shirt and chatting on his cellphone on the corner of South Street, as of 4 p.m. Tuesday, July 15. Jacob Wirth Getting A Facelift? Cheap Cheesecake - Today Only! Is that BU Jamba Juice Still Around? 1000 Words - Want a 3G Iphone? Get in Line. My July 4th Was Great! How Was Yours? How Much Is Brody Paid to Hang Out With Us?